Brutal Legend (which has one of those horizontal “:” things over the “u” that I couldn’t figure out on my Dell) is an action-adventure game that apparently has RTS elements from 2009, The Red Strings Club is an action-adventure cyberpunk game from earlier this year, and Tyranny, a game from 2016 that builds off mechanics from the isometric RPG, Pillars of Eternity, which was also released for free on Twitch Prime earlier this month. Twitch Prime (a part of Amazon Prime) is giving away 21 free games to subscribers, so I decided to check them all out for just one hour each and give my early impressions in exactly 200 words. You can check out my reviews for Pillars of Eternity, Q.U.B.E. 2, Battle Chef Brigade, Metal Slug 3,Twinkle Star Sprites, The Last Blade, Manual Samuel, GoNNER, Next Up Hero, Uurnog Unlimited, Hue, Deponia Doomsday, Observer, Tacoma, and The Bridge in the included links. My laptop finally met its match. Jack Black does a great job voicing the goofy main character, the soundtrack is full of great licenced heavy metal tracks, the art style was stylized enough to not look grating a near decade later, and combat seems to be similar to Bayonetta. But it runs horribly on my laptop, and from a quick search online, I’m not the only one, with people with high-end PCs having the same problem. Not only are there dumb issues with the screen that I won’t go into, but input lag on any setting is atrocious, taking nearly a second for each command. Combine that with car segments that require fast reflexes, and you’ve got a broken game. Some people found a way to fix it by going into the game’s code, but you should not have to hack your own game in order to make it run properly. You might as well get it while it’s free, because I can easily see myself having a total blast with this game if it ran properly, and I was still laughing at the quippy dialogue and nonsensical antics of a heavy metal roadie fighting his way through literal Hell. Brutal Legend is available for free through Twitch Prime until July 27th. Either Wikipedia lied to me, or I haven’t gotten to the action-adventure part of the game yet. (I’m banking on the former.) But it was right about one thing, because everything in this game oozes of that aesthetic, from the smooth electronic music to the story of an evil corporation aiming to install emotional implants into the population in order to make everyone obedient. The story was a bit hard to follow at first, with all of the sci-fi lingo being tossed around without much explanation, but the pieces slowly come together into something cohesive and engaging, even if it is a bit grotesque and even risque at some parts. One mode was bartending, in which you serve drinks to draw out a specific mood from your customers, usually to get information. The other was sculpting implants, which requires a steady hand on the mouse as well as figuring out the best carving tools to use, and then choosing which emotional implant will help your clients the most by reading their files. When the plot isn’t progressing, it can actually be a very zen experience, with long stretches of time with just carefully sculpting along to the equally zen soundtrack. The Red Strings Club is available for free through Twitch Prime until July 21st. Tyranny sees you sided with an antagonistic army under the rule of a leader who might as well be Sauron. You could certainly call the heaps of backstory served up in the first hour “rich” or “deep,” but it does few favors for someone who just wants to play it for an hour and never come back to it, clearly not what this game was designed for. Most of my comments on Pillars of Eternity stand with Tyranny as well, including the largely passive but still complex combat system, serene music, and often overwhelming choices for dialogue. The key difference is the scope, as you are now a high-ranking messenger for this evil army, as opposed to a lowly traveler. 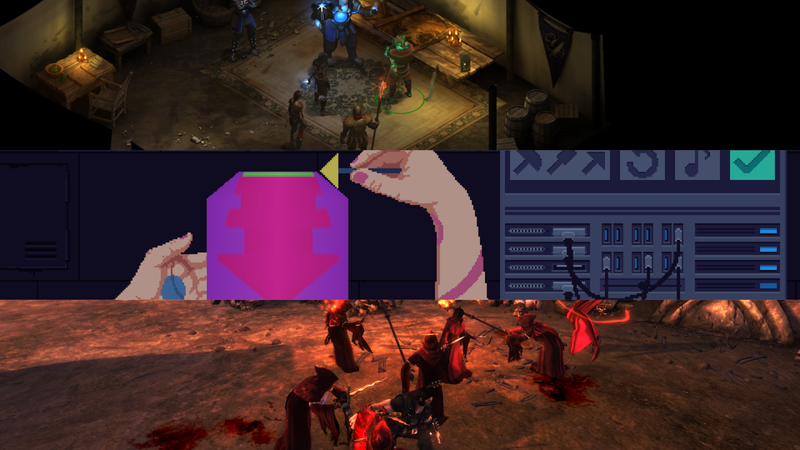 Oddly enough, the art style takes a slightly more vibrant turn from the rustic art of Pillars of Eternity, although the actual in-game assets seem to be nearly identical. I accomplished far more in my first hour with Pillars of Eternity than in Tyranny, mainly just waiting through conversations with few breaks for combat in the latter. Still, it’s harder to glean what the entire experience is like from the first hour when the full game runs for 25 hours. Tyranny - Commander Edition is available for free through Twitch Prime until July 17th, which is tomorrow!